Their best chance at a cure is a bone marrow transplant, but it only cures between 25 and 50 percent of patients – if they even survive long enough to receive the live-saving stem cells. 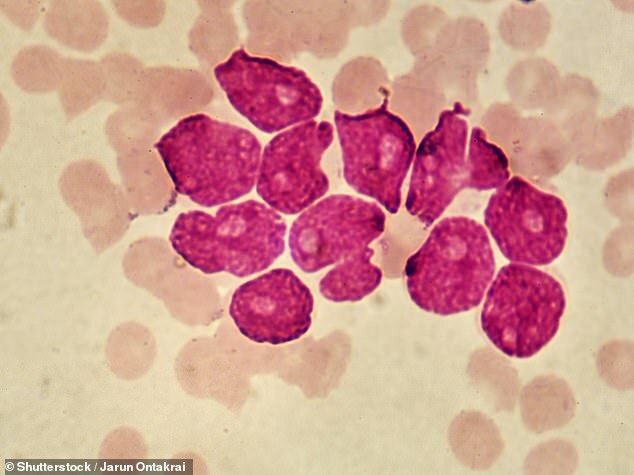 ‘We’re very excited about the survivals we’ve seen,’ lead study author Dr Alexander Perl, a professor of oncology and hematology at the University of Pennsylvania’s Perelman School of Medicine told Daily Mail Online. The three-year survival rate for people who have this kind of leukemia – FLT3-ITD positive AML – is just 44 percent. A treatment specific to this subset of AML, approved in 2017, has helped to keep the cancer in check, but hasn’t proven to be a cure. The drug ‘can really help, but as a single agent, it doesn’t induce remission,’ says Dr Perl. ‘We need better drugs than that. ‘Patients stabilize, they feel better…but [the drug] has yucky side effects like nausea, extreme fatigue,’ he explains. This has been true for both of the two latest treatments for AML. ‘While all these [effects] are telling us we’re barking up the right tree, they haven’t given us a satisfactory way forward,’ says Dr Perl. Often these drugs, which run interference the FLT gene mutation that makes the cancer hard to treat, don’t work for very long and the cancer then develops additional mutations. In short, drugs for this form of AML either worked well, but had terrible side effects, didn’t work for very long, or didn’t target FLT mutations well enough. ‘We wanted a drug that checked all the boxes,’ says Dr Perl. ‘Gilteritinib basically does all those things. And many patients don’t have to take it at that highest dosage for gilteritinib to work, making it truly ‘personalized medicine,’ Dr Perl says. Compared to patients on the standard chemotherapy regimen, those who took gilteritinib survived 66 percent longer, according to the results, presented at this year’s American Association for Cancer Research meeting. Typically, AML patients have to have regular blood transfusions to give them normal, functioning white blood cells. It’s a fairly effective, but tiresome way of managing the disease. But the majority of patient in the gilteritinib trial were able to give up the blood transfusions, and just continue taking their cancer drug at home, instead of getting chemotherapy at a hospital. All of this suggests the drug should be ‘the new standard of care for this population,’ says Dr Perl. ‘We’ve moved this subgroup from inpatient to outpatient and the toxicity is very compatible with out-patient management,’ he adds.